Comments: A very small, pale yellow-green Trig. 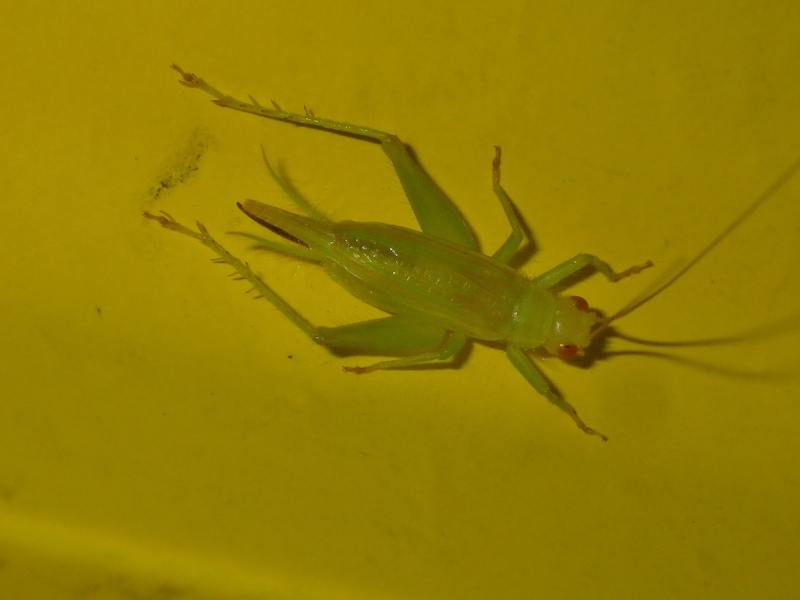 The color of the head, body, legs, and wings are pale lime green to yellow green; the eyes are often red or yellow (Caudell, 1907, said they were black). 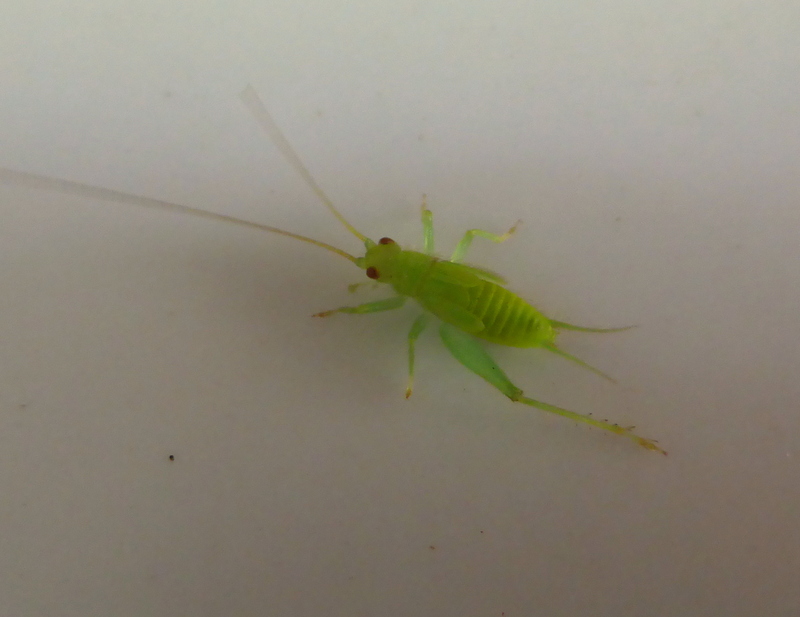 The ovipositor is contrastingly dark brown. Other Trigs are similar in size but are either brown (Anaxipha, Falcicula) or red and black (Phyllopalpus). 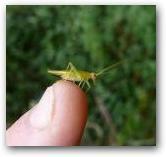 Tree crickets are similar in color but are larger and do not have hindwings that extend beyond the tegmina. Structural Features: The tegmina are longer than the abdomen and the curled hindwings project beyond them by half their length (Caudell, 1907). 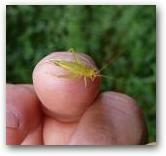 Like other Trigs, the ovipositor is sword-shaped -- sharp and curving upwards -- and is about 3.5 mm long. Singing Behavior: Songs consist of short trills -- chirps -- that have a particular clear and ringing quality. Walker (1969) described them as sounding like a "steady musical throb, reminiscent of the jing of sleigh bells in the distance." 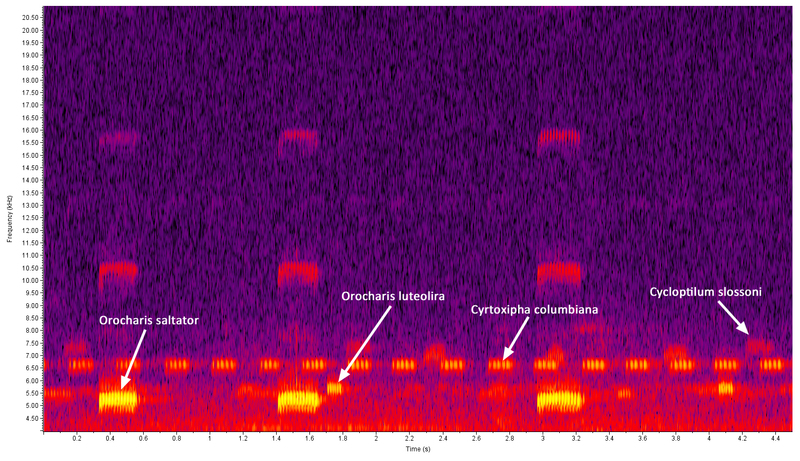 Each chirp consists of about five pulses, with a substantial break between chirps; the chirp rate is between 3-4 per second. Each syllable is over-slurred and occupying a narrow frequency range, both of which tend to give it a musical quality. The dominant frequency at 80 F (26 C) is between 6.6 and 7 kHz (SINA, 2018). 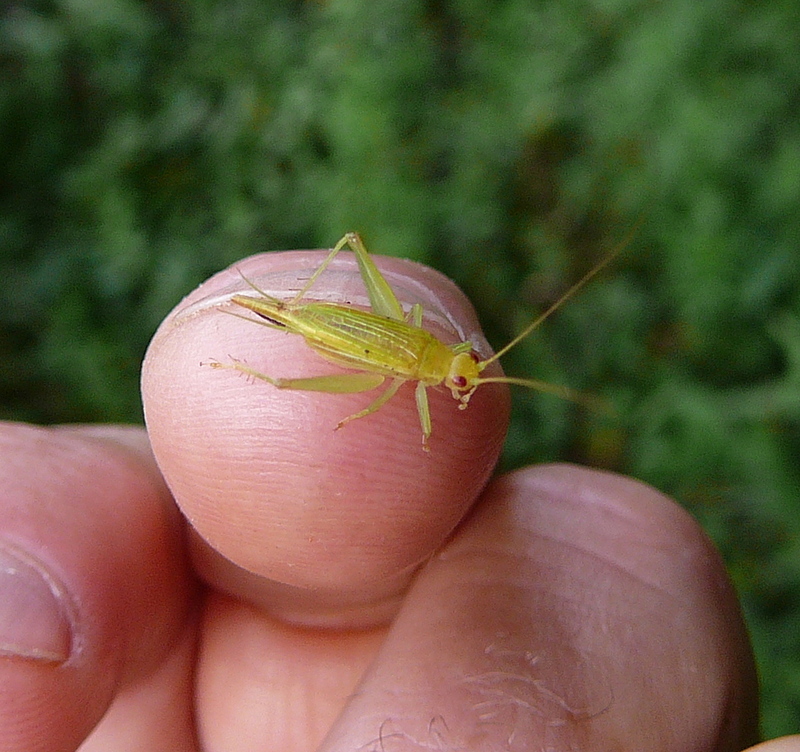 As first noted by Allard (1910): "These crickets sometimes congregate in great numbers in certain trees. Their trills then become wonderfully synchronal until veritable waves of music issue from the trees." 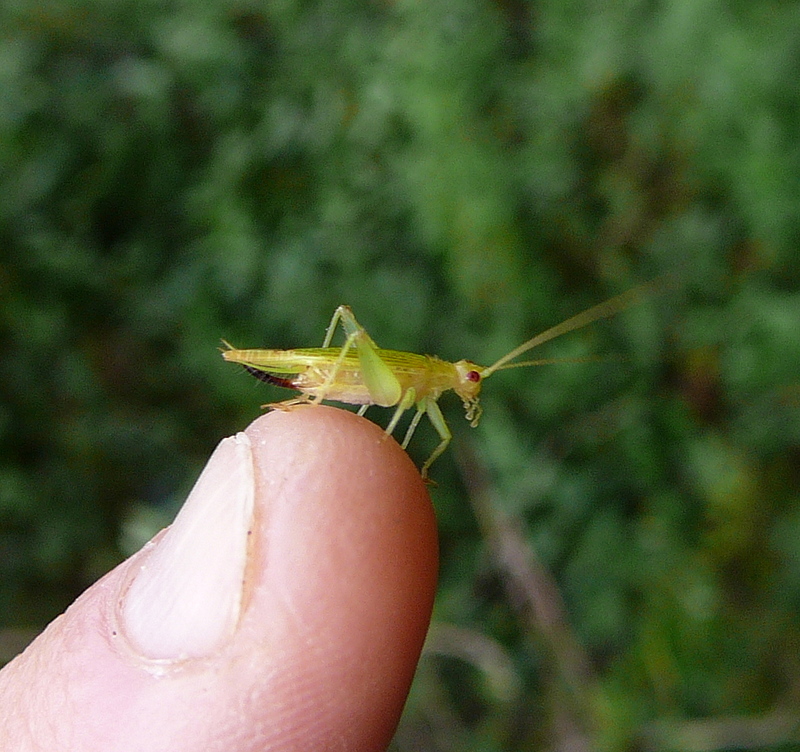 According to Fulton (1932), this is one of only three species in North Carolina known to have synchronal singing, the others being Oecanthus fultoni and Neoconocephalus exiliscanorus (True Katydids also synchronize their songs within small groups but alternate their songs with other groups; in Cyrtoxipha, all males in a chorus may be synchronized). Habitats: This species inhabits small to large deciduous trees and shrubs, with habitats including peach orchards as well as mature hardwood forests. Elliott and Hershberger (2007) noted a preference -- at least in developed areas -- for Bradford Pears and Crape Myrtles. 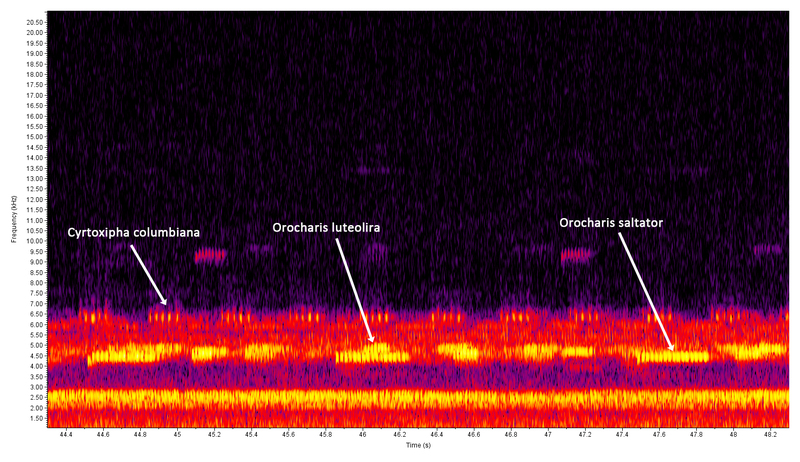 One large chorus recorded in west Raleigh was, in fact, associated with these species. Observation Methods: Mostly easily detected by its song, which is usually performed up in the trees out of reach. Elliott and Hershberger (2007) state that they can be collected by shaking the trees where they are present, knocking them down onto a sheet spread underneath. They also can be found on cars parked beneath their choruses, especially following a rain. Adult Phenology: In the vicinity of Raleigh, Fulton (1951) observed that males start singing in mid-July and persist until early October. We now have records from west Raleigh as early as late June and at least one from as late as October 22. Comments: Although we still have too few records for this species in North Carolina -- probably reflecting the difficulty in collecting specimens -- they do not appear to be specialized in terms of habitats or host plants and probably occur commonly across most of the state. Provisionally, at least, they appear to be quite secure in the state.